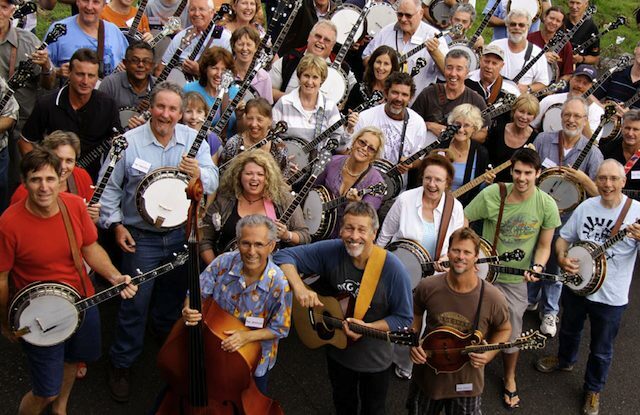 Just when you think the line up for this year’s 6th Australian Banjo and Bluegrass Conference couldn’t get any stronger, convenor Peter Nahuysen has announced that Australian banjo legend Ian Simpson is also now part of the faculty. Ian will be performing at all the 3 scheduled December concerts as well as conducting workshops over the 3 day event. Ian will also be showcasing some of the tunes from his latest album Banjo Australis – Under The Milky Way. So looking at the full stellar line up this year, the conference will feature headliners Jens Kruger and Alan Munde from the USA, Ian Simpson, Hamish Davidson, George Jackson and his band The Company. Others on the faculty include popular conference regulars Gary Vann (fiddle, mandolin, banjo), Wendy Holman (jam skills), Mark Nahuysen (guitar) and Peter Nahuysen (banjo). Members of the Company will also be instructing on their respective instruments – Michael Patrick (mandolin and fiddle) Markus Karlsen (bass) and Jamie Clark (guitar) That is a faculty of 13, by far the biggest in the conferences’ 6 year history. Peter tells us that there are still a couple of spots left on the conference for bluegrass musicians of all persuasions, whether they be looking for tuition on guitar, fiddle, mandolin, bass or of course banjo. Or if you are a Dobro player, Hamish Davidson will be there to teach Dobro as well. But you will need to be quick. For those who have not attended before, the venue is wonderfully suited for this kind of an event and is beautifully located on a scenic mountain ridge in the Sunshine Coast Hinterland. The rooms are ensuited and very comfortable, the food is fabulous and the ethos very friendly and conducive to learning and playing bluegrass music. A reminder the dates for this years’ conference are Thursday December 12th till Sunday December 15th. The venue is Tranquil Park Resort, Mountain View Rd Maleny, and the cost is $780 for the 3 days. Or call conference convenor Peter Nahuysen on 0416 113496. Just showed my housemate this as she’s been learning banjo for the past few months. If you get the chance you should get every available banjo to play wagon wheel by Old Crow Medicine Show and vlog it. I think tears of happiness would be cried.